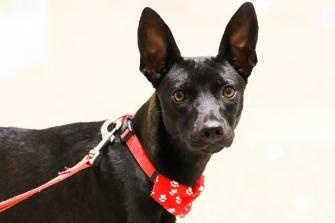 Nira is a sweet and affectionate puppy! She loves being around people of all ages. She gets along well with dogs and cats. 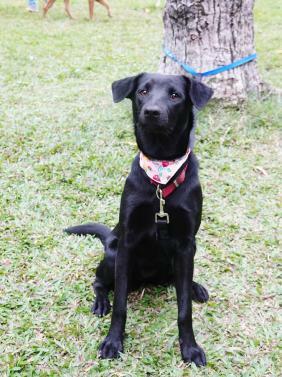 Nira is a super sweet and cuddly puppy with shiny black coat. She has a pair of beautiful sparkling eyes and the cutest pointy ears ever. 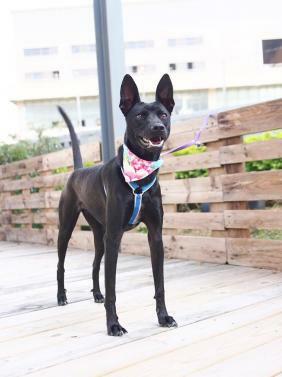 She is an affectionate puppy but very stable and follows directions well; she gets along well with other dogs and cats too. She may be a little withdrawn when meeting strangers, but will warm up quickly! Please watch her videos to learn more about this cute little fur ball! As puppies, Nira and her siblings went through a great deal of suffering. But thanks to the relentless efforts of the rescuers, they all survived, and two to them already lived with loving families now. It all began during the spring raining season, the rescuer received a message with pictures of four puppies; they fell into a ditch and two had multiple wounds on their bodies. Immediately the rescuers set out to look for them. Due to bad weather and flooding, it took several tries of the rescuers to finally got hold of the puppies. All puppies were treated in the hospital and cared for. In the meantime the weather turned worse, the pouring rain caused severe flooding in many areas. Nira was one of the lucky puppies that were saved just in time! The original plan was to do TNR (trap/neuter/release) on those puppies. Over the period staying in the hospital, they became much attached to people that made it harder to release them to the wild. The rescuer did not have the heart to let them go considering weather still being cold and raining. They were placed with foster homes with good care and training. Now Nira and her sister Nadine are doing great in their foster homes. 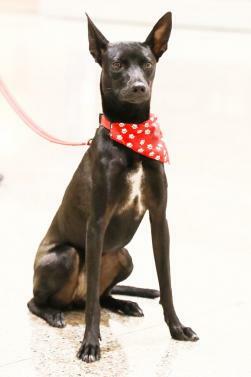 Nira will be a great companion for any type of family if she’s given a second chance! 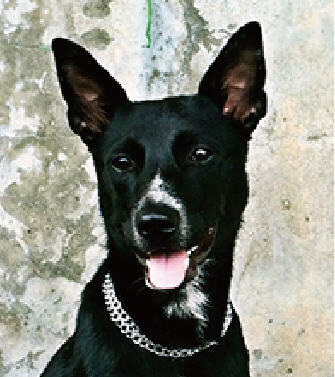 Please watch Nira videos below: The videos will give you a good idea of the dog’s temperament: (However, some dogs react differently with different owners. The videos show how Nira is now in foster home).